Tropical Depression Gaemi moved through Taiwan and was tracking to the northeast in the Northwestern Pacific Ocean on June 15. NASA's Aqua satellite provided a visible image of the storm that showed it as an elongated system. The Moderate Resolution Imaging Spectroradiometer or MODIS instrument aboard NASA's Aqua satellite saw Tropical Storm Gaemi exit Taiwan and move into the Northwestern Pacific Ocean on June 15 at 1:10 a.m. EDT (0510 UTC). 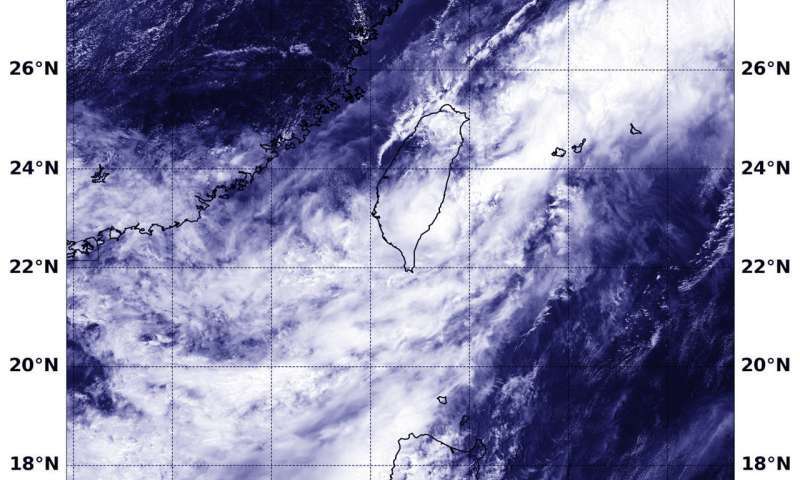 Gaemi appeared elongated after it moved over Taiwan, and the strongest thunderstorms were northeast of the center of circulation and over open waters. At 5 a.m. EDT (0900 UTC) on June 15, the Joint Typhoon Warning Center noted that Gaemi had maximum sustained winds near 34.5 mph (30 knots/55.5 kph). Gaemi was centered near 23.2 degrees north latitude and 121.8 degrees east longitude. That's approximately 115 nautical miles south of Taipei, Taiwan. Gaemi was moving to the east-northeast. The Joint Typhoon Warning Center noted that Gaemi will strengthen to a tropical storm again before becoming extra-tropical near Okinawa Island, Japan.